Farm Hack attended the Young Farmers Conference at the Stone Barns Center for Food and Agriculture in Tarrytown, NY this past weekend. One of the exciting outcomes of the conference was this piece by Andrew Revkin at the New York Times. 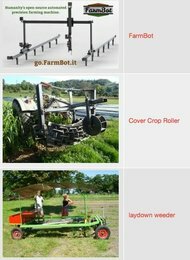 It highlights the efforts of Farm Hack and Slow Tools to support the development of open source tools for resilient agriculture. The Slow Tools Summit is an annual gathering of farmers, engineers, and makers. This year the group came together the day after the Young Farmer’s Conference to brainstorm solutions to problems faced by farmers. The group was led by Adam Lemieux, from Johnny’s Selected Seeds, and Jack Algiere of the Stone Barns Center. Farm Hack is looking forward to developing these partnerships. 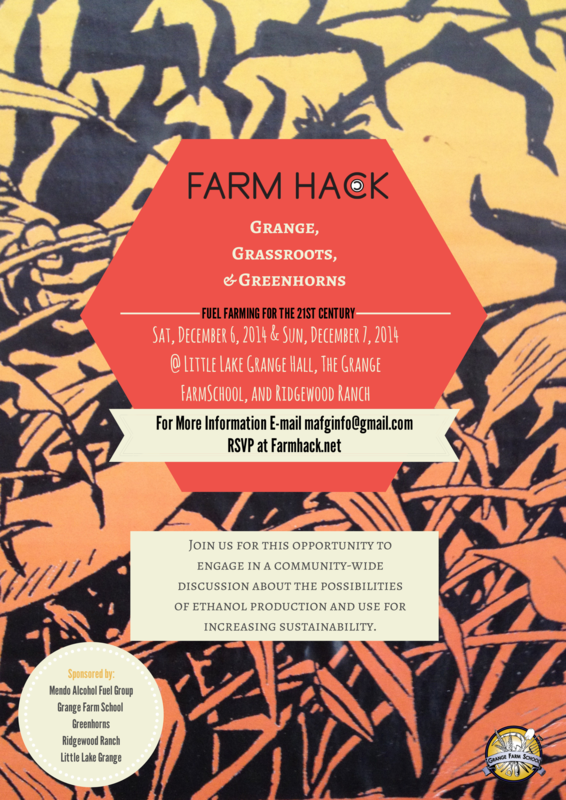 This weekend in Willits, Mendocino County, CA, a group of farmers, fuel alcohol enthusiasts, and organizations is sponsoring Farm Hack Mendocino: Grange, Grassroots, and Greenhorns, Fuel Farming for the 21st Century. The event will bring together stakeholders who envision and are active in building regional, sustainable fuel alcohol production systems in Northern CA. The two day event will include speakers covering a range of topics in regional biofuel production, mechanical demonstrations, tours of the historic Ridgewood Ranch still and the Grange Farm School, panel discussions, and networking opportunities for local businesses, nonprofits, and individuals. Keynote speakers are Cody Bartholomew, Manager of Golden Rule Ranch, Ruth King, Manager of the Grange Farm School, John Wick, Marin Carbon Project, and Jerome Carman, Redwood Coast Energy Authority. The event will begin on Saturday morning at the Little Lake Grange (291 School St, Willits) and will continue in the afternoon at the Ridgewood Ranch and Grange Farm School (16200 N Hwy 101, Willits). This two day event will highlight the work of the Mendocino Alcohol Fuel Group, a group of home distillers who use their locally produced fuel to power everything from small agricultural tools to cars, trucks, and tractors. Farm Hack Mendocino is an opportunity to gather a diverse group of stakeholders working to explore the possibilities of ethanol production and use in the region. In a region that produces wine grapes as an export crop, and devotes the majority of farmland to irrigated crops–exploring ‘value added’ uses for the pressed grapes in the post-production waste stream can provide greater regional resiliency and fuel sovereignty. Farm Hack Mendocino will explore the historic precedent, the present climate, and the future possibilities for producing fuel from a wide array of feedstocks in Northern CA. This event is free and open to the public. Lunches are provided, and donations are gladly accepted. Please RSVP at the Farm Hack Mendocino event page at farmhack.net. A full schedule for the event is available here. Please direct any questions to Daniel Grover, Farm Hack Network Facilitator, daniel.b.grover@gmail.com, (703)965-7636 or Ruth King, Mendocino Organizer, ruthfking@gmail.com, (860)670-7146.